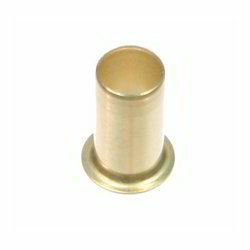 We are a leading Manufacturer of brass tubular rivets from Jamnagar, India. Since the inception of our firm in this domain, we are actively engaged in offering a wide array of Brass Tubular Rivets. These products are developed using utmost quality basic material as per the industry norms. Owing to their high corrosion resistance and optimum finish, these products are widely demanded in the market. In addition to this, our patrons can avail these rivets from us in a stipulated time frame at nominal rates.